Who Said There Wasn’t Room for Wonder Bread in Gourmet Cooking? ***No, this is not a grilled-cheese sandwich! I have to give it up to my favorite cooking mag Saveur (and subsequently the chef who created this recipe, Bruce Sherman of North Pond in Chicago) for introducing me to one of the coolest, most creative and tasty ways to cook fish. In the October, 2007 issue of Saveur, there is a recipe for Bread-Crusted Halibut. When I read the recipe, I got so excited to try it. I had never (nor would ever) thought of utilizing white bread as a way to encrust a fillet of fish – BRILLIANT! First of all, I haven’t purchased a loaf of white Wonder Bread in about, well… hmmm… maybe since college? Actually, screw that. I couldn’t afford a loaf of Wonder Bread in college. I believe the last time I ate the 99 cent special was 1985, until my mom realized it was not as good for us as wheat bread and made us switch. So there I was in the store, bypassing my stupid (but delish) and ridiculously overpriced $4 loaf of organic whole grain bread, and grabbing the soft, airy 99 cent white-bread loaf. Although I was glad I was saving some dough (no pun intended), I wondered what the hell I was really going to do with 25 slices of uneaten white bread. PB&J for two weeks? Baloney and Cheese? Crutons, anyone? Whatever, for 99 cents I could throw the rest out! (Guess what? I figured out a way to use those extra slices!! See the “Update” down at the end of this post). The recipe in Saveur called for halibut, but I didn’t feel like biking the 15 blocks to the fish monger so I bought the nicest looking fish at my grocery store, red snapper. You can definitely substitute a fillet of any type of firm white fish for this recipe. And let me tell you, using white bread as the crust for a filet of fish is absolutely delicious. It was buttery and crispy. I highly recommend trying this!! Slice your snapper into pieces the width of a piece of crust-less white bread. Feel free to use a piece as your ruler. Season your fish with some salt and pepper. Brush one side of the fish with the eggwhite. If using fish with skin, make sure you brush it on the skinless side. (You can use skinless fish or fish with skin on. Just make sure you score the skin to avoid it from curling up when cooking). Press a piece of crustless white bread on to the side of fish you just brushed with eggwash. Press down so it adheres. Do this with each piece of fish. 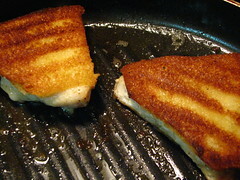 Cut away any of the excess bread that is overlapping the sides of the fish. Meanwhile, make your lemon butter sauce. Saute your diced onion in some butter or oliveoil until translucent. Deglaze with your white wine. Let the wine simmer down until only about 1-2 tablespoons remain. Add the lemon juice and let simmer for another minute or so then add your cream and the butter, allowing it to simmer for a few more minutes so it’s thick. Add a pinch of salt if necessary (sometimes this helps balance out the tartness of the lemon). Keep warm. Now, back to the fish. Heat up a tablespoon or two of butter along with a tablespoon or two of olive oil. When melted, add the fish, bread side down, to the pan. Allow to saute about 2 1/2 minutes on the bread side, then flip to saute the skin side. Cook about 5-6 minutes depending on the thickness of your fish. The bread side should be crispy and browned. If you think it needs more time to brown, allow to saute for another 30 seconds or so. Serve topped with your lemon butter sauce and with your choice of sides. 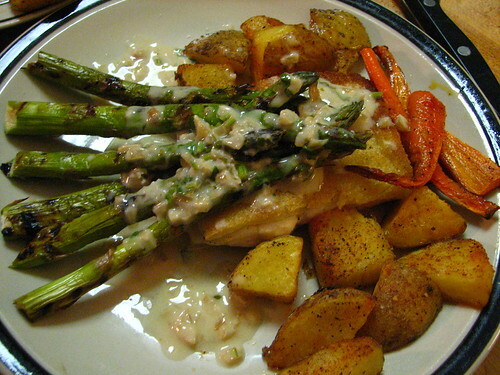 We liked grilled asparagus and roasted potatoes/carrots medley. Enjoy! ***UPDATE: Four days later I had friends over for dinner and ended up using all the rest of the white bread for some appetizers. These appetizers were very gross-looking, very 1950’s, but very delish to eat. You mix about 3/4 of a cup of mayo (I know… it already sounds gross), with a tablespoon of Worcestershire Sauce and a good handful of parmesean cheese. Mix. Spread on crustless white bread and toast in oven for 10 minutes. Cut into triangles. Voila! Could Cheap White Bread Be the Answer to the End of World Hunger? Free Lunch for Inner-City Kids – If It’s Free Does It Have To Be Crap? it looked gross (the bread/mayo crusts) and , if you thought about the fact that you were actually eating baked mayonnaise for more than a second it kind of stuck in your throat, but suspending my disbelief worked well and i rather enjoyed them in the end. i suspect we’ll be bringing out this old chestnut in the future, possibly expanding upon the ingredients to make a few different kinds. Delightful article, although I was too distracted to really enjoy every single word. I love the pictures and the warmth and how you treated the subject matter.